NEW Carabiner badge reels feature a snappy and secure "carabiner style" wire gate for clipping badge reels to belt loops and straps. Sporty chrome trim with durable translucent plastic body. Retractable cord pulls out to approx. 30". Custom full color imprint of your name, logo or message in a color of your choice. 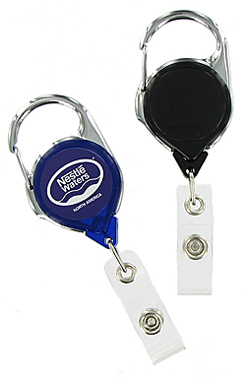 Includes vinyl strap clip for attaching id cards and name badge holders. CARABINER BADGE REELS AT DISCOUNTED PRICES! Most colors available in both solid and translucent. Carabiner badge reels are Lowest Price Highest Quality! -Second side imprint: Add $0.50 ea. Thank you Anna. Ordering with you was so easy and painless. The product looks great!